I homeschooled my six children from kindergarten through 12th grade. In the beginning, we were very structured. I enrolled my children with a homeschool program that had once been a school. I spent my life monitoring them doing their “schoolwork”. Watching them produce this much schoolwork ( some of it ‘busy work’) every quarter, every week, indeed, every day. If we skipped a day, we would get behind. Keeping up the house. Cooking. Taking care of babies and toddlers. And grading, grading, grading. After we had moved from one state to another, we once went back “home” for a visit, and another homeschooling mom asked me how ours was going. I said I was behind on the grading, and she said with a laugh, “Margaret Mary, you are always behind on the grading!” That was the reputation I had left behind. On weekends, my husband would want me to do things with the family – and all I wanted was to go off by myself. But I would go…or do…with the family. I think sometimes I did go off by myself, without ever leaving the house or the room, whether it was by reading or writing, planning the weeks’ meals, or just thinking or spacing out. Sometimes I was present physically, while I wasn’t really present in the moment. I look back on those days and I wonder what it would have been like if I had had the internet then, as we do now. Would I have ever been truly present…or did I spend just as much time “away”, anyway? As time went on, I lightened up a bit. While I continued to get materials from the same school, I stopped having my younger kids enrolled. Then more time passed and I began planning my own curriculum. I learned about literature-based learning and that resonated with me. Whenever I had felt the need to do something with the kids and didn’t feel I could spend much money to do it, I would take them to the park or the library. And sometimes we would talk about their books. 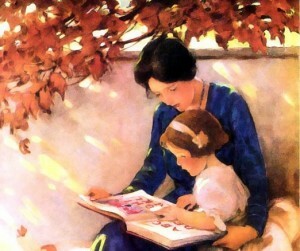 Now I was meeting women online who not only talked about their kids’ books with them, but actually read them to them. Even though the children could read! Wonder of wonders. How do you do that? When I learned about that, my kids were older, but I was so impressed. Family reading time. Wow. Although I didn’t do that, these same women also talked about talking with their kids…that it was okay for their kids to question things. That it is through questioning that we can address things, and grow, and grow together. That wasn’t the era I was brought up in. It wasn’t the air my older children had been brought up in. And I learned to discuss things with them, more openly. Because my husband insisted on family trips; because I had my children cook with me; because I discussed my kids’ books with them; because I lightened up over the years; and then finally, because I learned to listen to my kids even when I disagreed with them…I believe that, enough of the time (whatever “enough” is), I was “there for them” or “there with them”. The homeschooling helped…but it wasn’t just that I homeschooled them. It was because I learned to set aside the slavery to a pre-planned curriculum and accountability, as well as my slavery to my family. I could work hard for my family but I eventually had to learn to put them ahead of all the tasks that I did for them. I also learned to deal with my own issues, instead of sweeping them under the rug, so that I could better help them deal with theirs (okay, maybe that wasn’t the reason I dealt with mine, but being better able to help them was part of the result). And I learned to have some time to myself, so that when I have time with them, I can be there for them and with them. Whether you homeschool, or you run a chauffering service to school and soccer and dance, whether you’re a parent or a spouse, or a single person, I would like to invite you to learn a lesson that I learned, a lesson that I am still working on learning, every single day. Be present in the moment. By that, I don’t mean you should never deal with past issues; dealing with them may help you to live in the present. I don’t mean you shouldn’t have dreams and goals for the future. That may help you to be happier, as well as to have more “moments” in the future. But, let’s keep on trying to be present to those we love. If you have children, I would encourage you to read to them. Listen to them read to you. If they know how to read and you are not comfortable with introducing reading aloud together at this point, then read some of what they read, too, and discuss it together, in a friendly way. Sit side by side if you read together, or while you help them with homework. Sit side by side on the sofa and look through photo albums (Am I dating myself? Okay, look at pictures on the laptop?). When your teens say things that you find outrageous, you may want to ask them to talk about those things out of earshot of the ‘littles’, but find a time and place that they can discuss them – and be willing to hear them out. Give your own views gently, not as though it’s as simple as them being wrong and you being right because you are the parent, but truly listening, and then give them valid reasons for your position…or do research together on the topic. After all my years of parenting, I would never presume to tell anyone how they should school their children (away, at home, or how), but if there is one thing I have learned to be aware of – one thing I should probably work on, all my life – it is the need to be present to those we love, not every minute, not without our own hobbies, our own friends, our own life but, at least some of the time, to take the time and energy to just “be there”…truly and openly “there”.